The mitral valve (/ˈmaɪtrəl/), also known as the bicuspid valve or left atrioventricular valve, is a valve with two flaps in the heart, that lies between the left atrium and the left ventricle. The mitral valve and the tricuspid valve are known collectively as the atrioventricular valves because they lie between the atria and the ventricles of the heart. In normal conditions, blood flows through an open mitral valve during diastole with contraction of the left atrium, and the mitral valve closes during systole with contraction of the left ventricle. The valve opens and closes because of pressure differences, opening when there is greater pressure in the left atrium than ventricle, and closing when there is greater pressure in the ventricle than atrium. In abnormal conditions, blood may flow backwards through the valve (mitral regurgitation) or the mitral valve may be narrowed (mitral stenosis). Rheumatic heart disease often affects the mitral valve; the valve may also prolapse with age, and be affected by infective endocarditis. The mitral valve is named after the mitre of a bishop, which resembles its flaps. 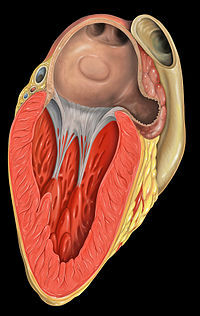 The mitral valve is typically 4 to 6 square centimetres (0.62 to 0.93 sq in) in area, and sits in the left heart between the left atrium and the left ventricle. It has two leaflets (or 'cusps'), an anteromedial leaflet, and a posterolateral leaftlet. The opening of the mitral valve is surrounded by a fibrous ring known as the mitral annulus. The anterior cusp covers approximately two-thirds of the valve (imagine a crescent moon within the circle, where the crescent represents the posterior cusp). Although the anterior leaflet takes up a larger part of the ring and rises higher, the posterior leaflet has a larger surface area. The left side of the heart. The mitral valve, as well as the chordae tendinae are visible as white strings. These connect to the papillary muscles visible attaching to the muscular ventricle. The valve leaflets are prevented from prolapsing into the left atrium by the action of chordae tendineae. The chordae tendineae are inelastic tendons attached at one end to papillary muscles in the left ventricle, and at the other to the valve cusps. Papillary muscles are finger-like projections from the wall of the left ventricle. The mitral annulus is a fibrous ring that is attached to the mitral valve leaflets. Unlike prosthetic valves, it is not continuous. The mitral annulus is saddle shaped and changes in shape throughout the cardiac cycle. The annulus contracts and reduces its surface area during systole to help provide complete closure of the leaflets. Expansion of the annulus can result in leaftlets that do not join soundly together, leading to functional mitral regurgitation. The normal diameter of the mitral annulus is 2.7 to 3.5 centimetres (1.1 to 1.4 in), and the circumference is 8 to 9 centimetres (3.1 to 3.5 in). Microscopically, there is no evidence of an annular structure anteriorly, where the mitral valve leaflet is contiguous with the posterior aortic root. During left ventricular diastole, after the pressure drops in the left ventricle due to relaxation of the ventricular myocardium, the mitral valve opens, and blood travels from the left atrium to the left ventricle. About 70 to 80% of the blood that travels across the mitral valve occurs during the early filling phase of the left ventricle. This early filling phase is due to active relaxation of the ventricular myocardium, causing a pressure gradient that allows a rapid flow of blood from the left atrium, across the mitral valve. This early filling across the mitral valve is seen on doppler echocardiography of the mitral valve as the E wave. After the E wave, there is a period of slow filling of the ventricle. Left atrial contraction (left atrial systole) (during left ventricular diastole) causes added blood to flow across the mitral valve immediately before left ventricular systole. This late flow across the open mitral valve is seen on doppler echocardiography of the mitral valve as the A wave. The late filling of the left ventricle contributes about 20% to the volume in the left ventricle prior to ventricular systole, and is known as the atrial kick. The mitral annulus changes in shape and size during the cardiac cycle. It is smaller at the end of atrial systole due to the contraction of the left atrium around it, like a sphincter. This reduction in annulus size at the end of atrial systole may be important for the proper coapting of the leaflets of the mitral valve when the left ventricle contracts and pumps blood. Leaking valves can be corrected by mitral valve annuloplasty, a common surgical procedure that aims at restoring proper leaflet adjustment. There are some valvular heart diseases that affect the mitral valve. Mitral stenosis is a narrowing of the valve. This can be heard as an opening snap in a heart sound which is not normally present. Classic mitral valve prolapse is caused by an excess of connective tissue that thickens the spongiosa layer of the cusp and separates collagen bundles in the fibrosa. This weakens the cusps and adjacent tissue, resulting in an increased cuspal area and lengthening of the chordae tendineae. Elongation of the chordae tendineae often causes rupture, commonly to the chordae attached to the posterior cusp. Advanced lesions—also commonly involving the posterior leaflet—lead to leaflet folding, inversion, and displacement toward the left atrium. A valve prolapse can result in mitral insufficiency which is a regurgitation or backflow of blood due to the incomplete closure of the valve. Surgery can be performed to replace or repair a damaged valve. A less invasive method is that of mitral valvuloplasty which uses a balloon catheter to open up a stenotic valve. Rarely there can be a severe form known as caseous calcification of the mitral valve that can be mistaken for intracardiac mass or thrombus. The closing of the mitral valve and the tricuspid valve constitutes the first heart sound (S1), which can be heard with a stethoscope. It is not the valve closure itself which produces the sound but the sudden cessation of blood flow, when the mitral and tricuspid valves close.. Abnormalities associated with the mitral valve can often be heard when listening with a stethoscope. The mitral valve is often also investigated using an ultrasound scan, which can reveal the size and flow of blood through the valve. The word mitral comes from Latin, meaning "shaped like a mitre" (bishop's hat). The word bicuspid uses combining forms of bi-, from Latin, meaning "double", and cusp, meaning "point", reflecting the dual-flap shape of the valve. The human heart, viewed from the front. The mitral valve is visible on the right as the "bicuspid valve"
The chest, showing surface relations of bones, lungs (purple), pleura (blue), and heart (red). Heart valves are labeled with "B", "T", "A", and "P". 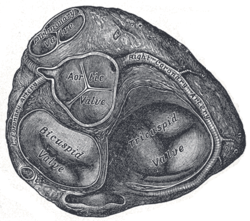 Mitral valve, viewed in a cadaver specimen from within the left atrium. ^ Nazari S, Carli F, Salvi S, et al. (Apr 2000). "Patterns of systolic stress distribution on mitral valve anterior leaflet chordal apparatus. A structural mechanical theoretical analysis". J Cardiovasc Surg (Torino). 41 (2): 193–202. PMID 10901521. ^ Mahmood, Feroze; Shakil, Omair; Mahmood, Bilal; Chaudhry, Maria; Matyal, Robina; Khabbaz, Kamal R. (December 2013). "Mitral Annulus: An Intraoperative Echocardiographic Perspective". Journal of Cardiothoracic and Vascular Anesthesia. 27 (6): 1355–1363. doi:10.1053/j.jvca.2013.02.008. ^ Perloff, JK; Roberts, WC (1972). "The mitral apparatus. Functional anatomy of mitral regurgitation". Circulation. 46 (2): 227–39. doi:10.1161/01.cir.46.2.227. ^ Pai RG, Varadarajan P, Tanimoto M (2003). "Effect of atrial fibrillation on the dynamics of mitral annular area". The Journal of Heart Valve Disease. 12 (1): 31–7. PMID 12578332. Retrieved 2010-03-04. ^ Playford, David; Weyman, Arthur (2001). 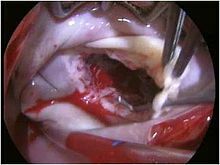 "Mitral valve prolapse: time for a fresh look". Reviews in Cardiovascular Medicine. 2 (2): 73–81. PMID 12439384. ^ Kosior, Dariusz A. (2014). "Mitral annulus caseous calcification mimicking cardiac mass in asymptomatic patient – multimodality imaging approach to incidental echocardiographic finding". Polish Journal of Radiology. 79: 88–90. doi:10.12659/PJR.889830. PMC 4005861. Anatomy figure: 20:07-03 at Human Anatomy Online, SUNY Downstate Medical Center — "Valves of the heart"